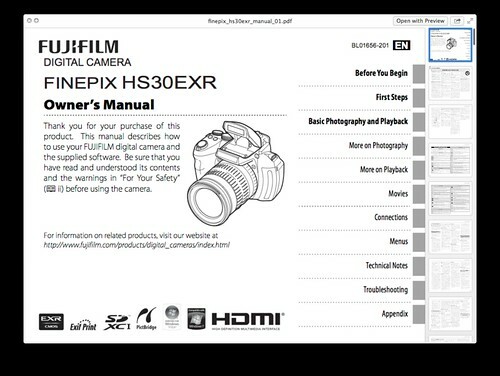 The official user guide for the Fuji HS30 EXR is a 146-page, 2.77 MB PDF document titled “Fujifilm FinePix HS30EXR Digital Camera Owner’s Manual”. Normal mode: Approx. 45 cm (1.4 ft.)–∞ (wide angle); 3 m (9.8 ft.)–∞ (telephoto). Macro mode: Approx. 7 cm–3 m/0.2 ft.–9.8 ft. (wide angle); 2 m–3.5 m/6.6ft.–11.4 ft. (telephoto). Super macro: approx. 1 cm–1 m/0.4 in.–3.3 ft. (wide angle). EF-20 — has a guide number of 20 (ISO 100), supports i-TTL, can be angled up to 90° for bounce-flash photography, and takes two AA 1.5 V batteries.